This week I shall post some recipes from my bookmarks or some successful experiments from my kitchen. These paniyarams were a delight to have and were quite filling. My family loved these and were happy to have them for breakfast and after school snack as well. Wash and soak urad dal, chana dal, moong dal, buckwheat for at least 3-4 hours. Grind the soaked and drained dals into a fine batter adding as much water as needed. Add in the washed idli rava into the batter. Add salt and set aside to ferment (8-12 hours). When ready to make paniyaram, add in chopped onions, green chili paste, curry leaves, coriander leaves. Heat the paniyaram pan (Abelskiver pan). Spray about 1/4 tsp of oil in each of the slots. Spoon in the batter into the greased slots, cover and let them cook. When the undersides are golden brown, flip them carefully and let the other side also get a light golden brown hue. Remove and continue with the rest of the batter. Check out the Blogging Marathon page for the other Blogging Marathoners doing this BM#89. Wow those bombs are super healthy packed ones..very nice use of all the dals and the buckwheat Harini...I have a packet still that I got for something else and I must make something like this I am sure! Healthy and protein packed paniyram. Very nutritious snack. Filling and tasty too. Nice pictures. Wow.. paniyaram looks so inviting and healthy.. perfect for upcoming moonson. Super healthy paniyarams. I can imagine pairing this with Nalini's tomato chutney...soooo delicious. Such a healthy share. Packed with proteins. I love savoury paniyaram more than the sweet ones. With whole lot of healthy ingredients, these paniyarams look so yum.. Excellent paniyarams, and with those healthy ingredients went in it, i would definitely enjoy them without any fuss. Great recipe for whole grain. My kids favorite lunch box recipe is paniyaram and this is a great protein filled option. 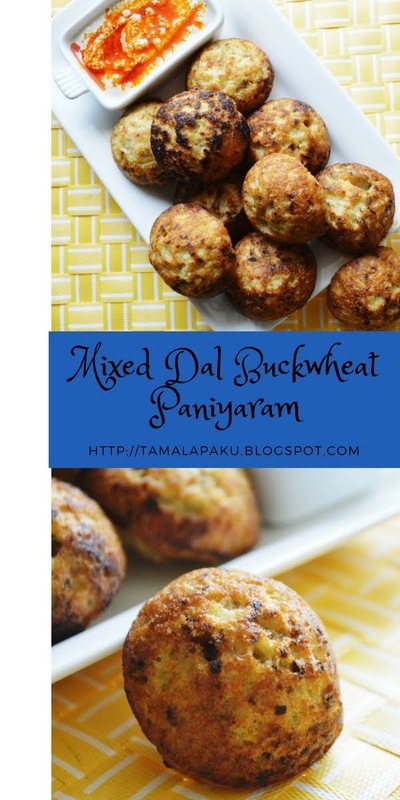 Mixed dal and buckwheat paniyaram sounds so healthy and of course tasty too.